The 2019 New York's Finger Lakes Regional Travel Guide - Request a FREE Guide Today! The Finger Lakes Travel Guide includes suggested places to stay, things to do, attractions & events, dining ideas, Finger Lakes wineries, lake information, great shopping ideas, as well as special discounts and promotions. Request a free guide below and we will mail to you or access our online version at the following links. This guide provides information on Fishing and Hunting in the Finger Lakes Region. Guide includes lake information, fishing derby information, maps, public hunting land listings, licensed fishing guides, charters and marinas and many travel and outdoor resources. Request your FREE Hard Copy 2019 Travel Guide to the Finger Lakes -- COMING SOON! Enter your information below and your Finger Lakes Regional Travel Guide will be mailed to you. Included in each order of the Finger Lakes Regional Travel Guide is a copy of our Finger Lakes Mini-Guide & Map, a convenient pocket-sized guide to the Finger Lakes with a regional map as well as information on activities and attractions, restaurants, shopping, and lodging options in the area. PLEASE NOTE, it may take up to 3-4 weeks in order to receive the guide through the form below due to fulfillment quantities at a given time. 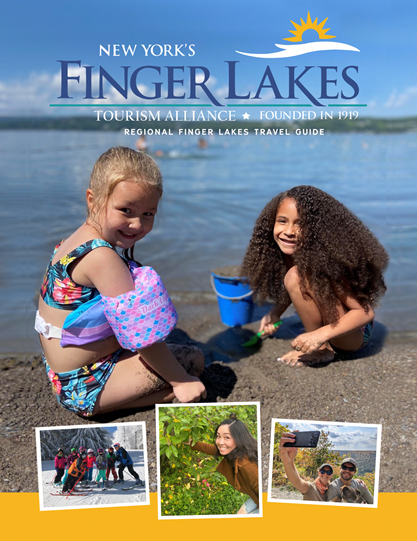 If you would like a quicker turnaround time to receive the guide, please contact the Finger Lakes Tourism Alliance (FLTA) office directly via email, info@fingerlakes.org or phone at 315-536-7488. Thank you for your understanding. If you live outside of Canada or US, please visit our flipbook online version. Yes, please send me every other month email updates about what’s happening in the Finger Lakes region. How can we better meet your needs on this website?